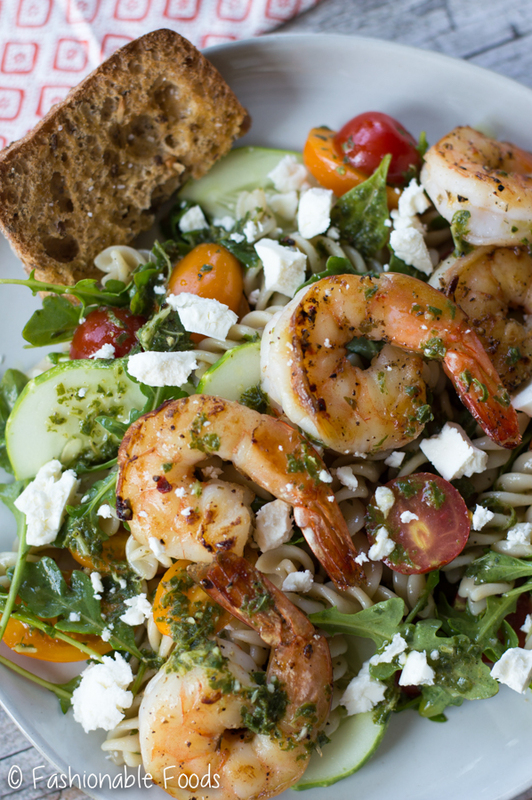 Perfectly seasoned shrimp sit atop a colorful mix of arugula, tomatoes, cucumbers, pasta, and feta cheese. 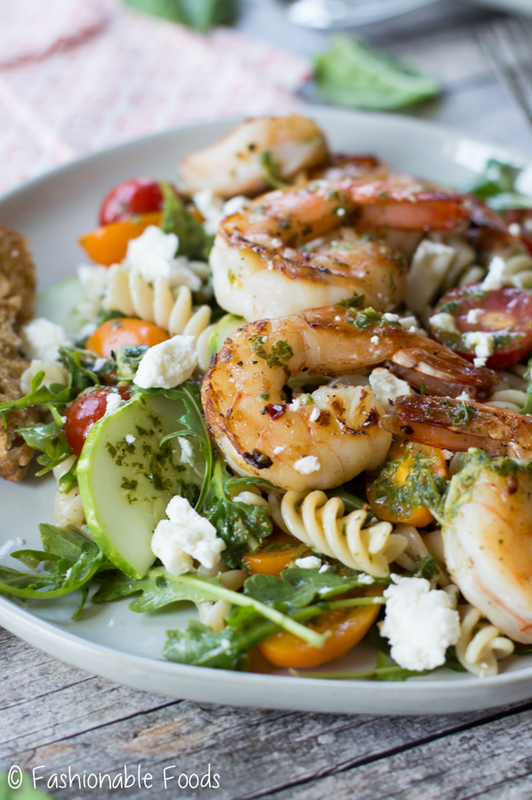 Tossed with my fresh basil vinaigrette and you have a fantastic summer meal. It’s September. For some that means FALL. For me that means hang-on-to-summer-as-long-as-physically-possible. I absolutely refuse to get into fall until it’s actually fall. So, come back after the solstice if you’re wanting fall recipes. ? My sincerest apologies if that sounded rude, but I love summer and I hate to see it go. And why do we always have to be so eager to make time to go faster?! The summer flew by (as it usually does), but once fall hits then Christmas is around the corner and then we are already in the New Year. Whoa. That escalated fast. The point is, I want time to slow down not speed up. Plus, I’ve been MIA most of the summer due to pregnancy sickness so humor me for a week to share a few summery eats. I’m sure there’s lots of you out there that feel as strongly about summer as me? Please, tell me you do. This is kind of a unique salad in that it’s a cross between a typical salad and a pasta salad. The ratio isn’t mostly pasta like most pasta salads are. 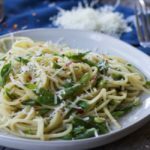 Rather we have a hefty mix of arugula, cucumbers, and tomatoes along with the pasta to give it more of a green salad feel. And let me tell you, adding pasta to green salads is my new favorite thing! Seriously, who doesn’t love pasta? I love a good salad, but a lot of time feel like I need more food, so adding pasta bulks it up a bit and makes it a more satisfying meal. We’re also adding succulent shrimp, a dusting of feta, and my favorite fresh basil vinaigrette. If it’s wrong to be obsessed with a salad dressing, then I don’t want to be right. Seriously, it’s that good. 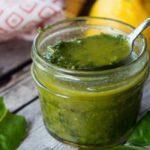 It’s a summer staple for using my garden basil and it’s always in my fridge. 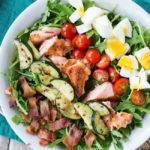 It’s the best for any green salad, pasta salad, caprese salad, grilled chicken, mixed with mayo for chicken salad… I could go on and on. Make.That.Dressing. And use it on everything. Trust me. Another great attribute of this salad is that it involves minimal cooking. 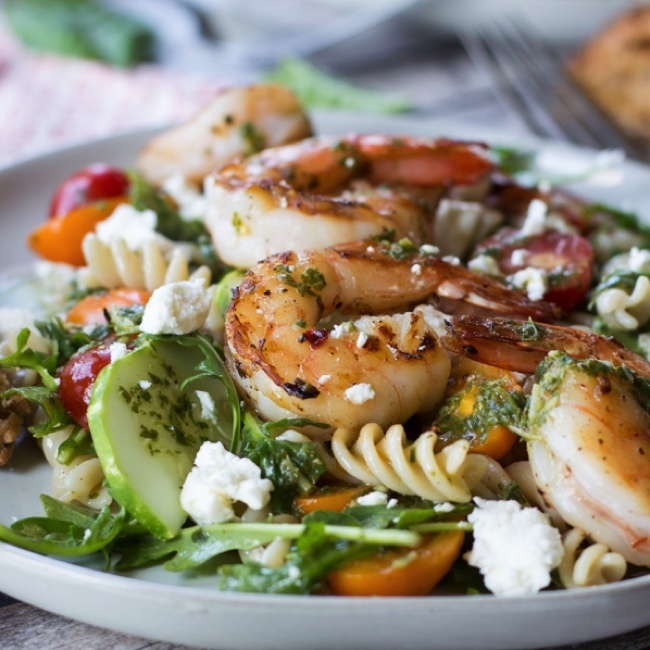 Just boil your pasta and sauté or grill some shrimp, which takes no time at all. Perfect for these hot and humid days when you don’t want to be stuck in the kitchen. Oh, and leftovers are just as delicious, so it also makes a great lunch the next day. This yummy salad makes me happy. 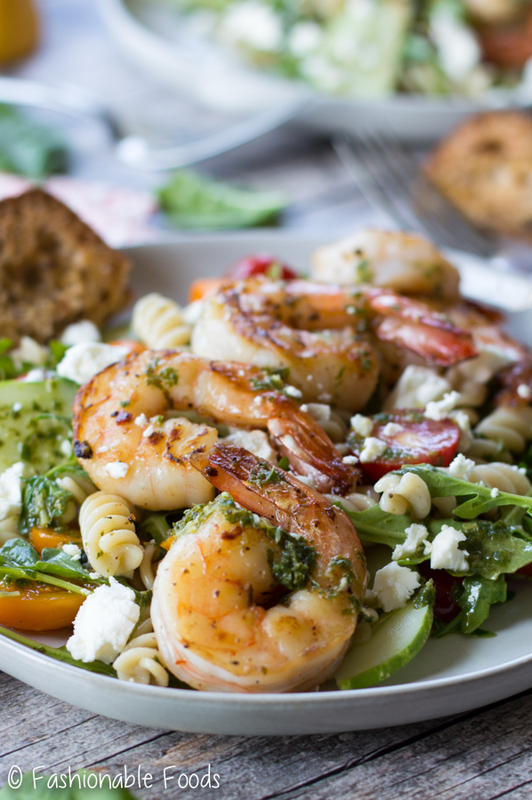 It has everything I love – veggies, pasta, shrimp, cheese, and that basil vinaigrette. It’s summer on a plate and I’m going to keep enjoying it until my tomato plants are dead. ? 12 oz. Rotini Pasta, regular or GF works! Bring a pot of water to a boil and salt it generously before adding your pasta. Cook the pasta to al dente and then drain. Rinse with cold water and transfer to a large bowl; set aside. Combine the shrimp, olive oil, honey, garlic, oregano, red pepper flakes, salt and pepper in a small bowl. Toss well to coat the shrimp. Heat a skillet over high heat and once hot, add the shrimp. Cook for 1-2 minutes per side or until the shrimp are opaque cooked through. Set aside on a plate to cool while you assemble the salads. To the pasta, add the cherry tomatoes, arugula, cucumber, and a few tablespoons of basil vinaigrette. Toss the salad, adding more vinaigrette if necessary. 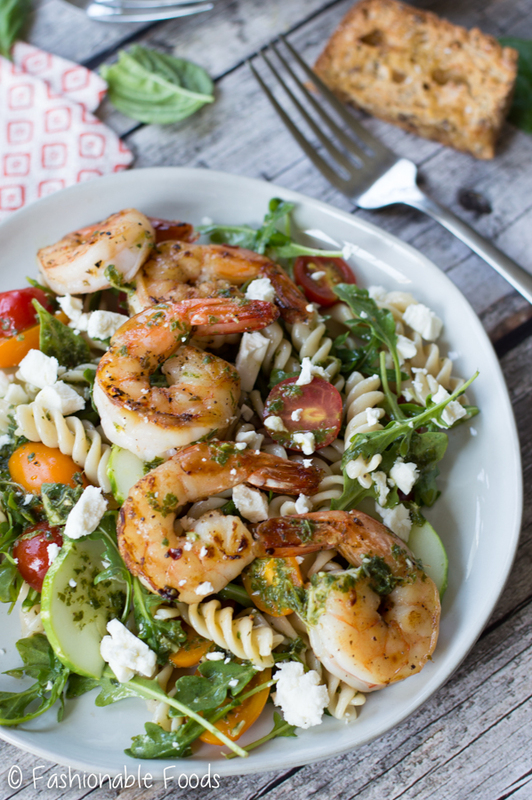 Divide the salad among 4 serving plates and top each with a sprinkle of feta and the shrimp. Enjoy!